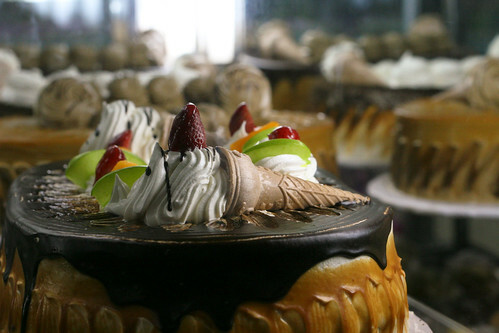 We walked down an entire street in Arequipa devoted to Tortas — Peruvian cakes, with mousse-like frosting often thicker than the sponge, shaped and carved like a fine work of art. Ice cream stores devoted to the art of sundae building covered their walls with pictures of their architectural masterpieces. It was all very impressive and a little overwhelming. The sweets addict in all of us knows that the pretty presentation and the promise of delight in a dessert can be an empty promise… and Perú has far too many pretty desserts. We decided to stay clear of some of the more towering and brightly colored treats — they could be the death of us, while the desserts we were looking for were simpler. 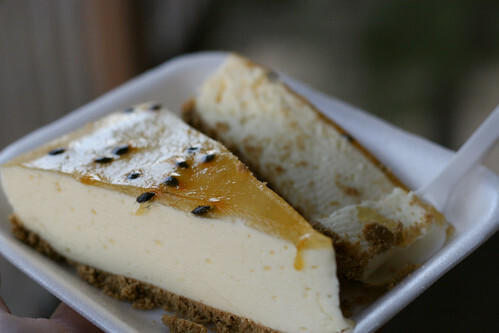 We had cheesecakes topped with Maracuja (passion fruit) and other jammy fruits that were common to the country. It was like tasting a little bit of home mixed with an exotic land. 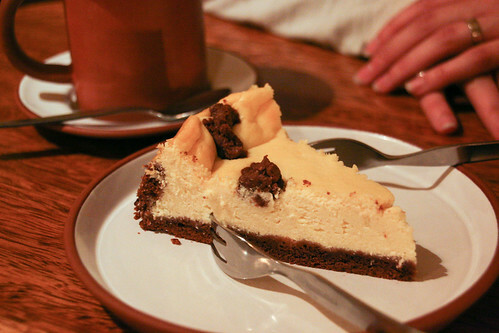 We also tried a cheesecake at Heidi Grandja in Cusco made of quark — a sort of country cream cheese that is less sweet and makes a crumblier cake with more of a true cheese flavor, almost like a savory cheesecake. The native fruits of Perú were common in everything from ice creams to mousses and puddings. Besides Maracuja, there were many fruits we were excited to try and had never heard of before. Chirimoya (custard apple), Guanabana (similar to Chirimoya, not very sweet) and Lucuma (like a creamy melon?) are all hard to describe because they are fruits not found in what we now understand to be a very limited grocery stand in America. One of the best desserts we had was simple: just whipped Chirimoya, made into a light mousse, at Pescados Capitales, in Lima. There were desserts we were familiar with but had Spanish names. 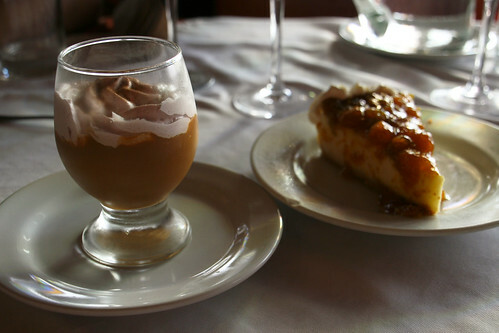 Leche Asado is our Creme Brulée and Crema Voltado was our flan. We found rice pudding everywhere and with it something new, Mazamorra, a dark rice-pudding like dessert made from mulberry maize. The delicious Tres Leches is sadly in the background! 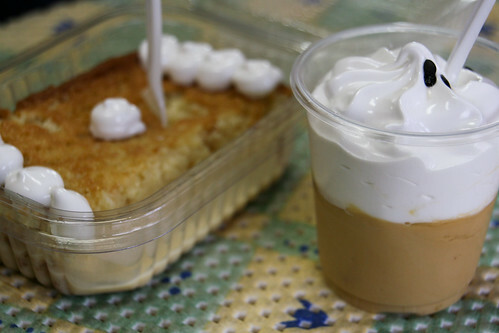 Tres Leches is all over Mexico and America, but in Perú it was like a new dessert altogether. A light sponge cake soaking in a sweet milk sauce creates both a cake and a pudding texture that we both enjoyed enough to actually buy a few times. 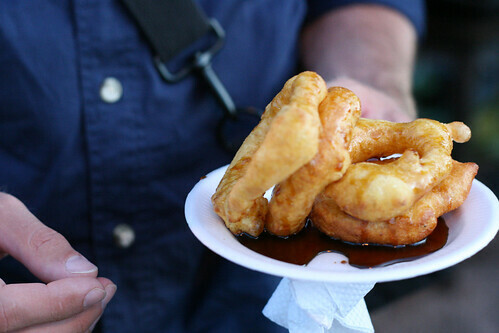 Picarones are like a Peruvian donut mixed with a churro. 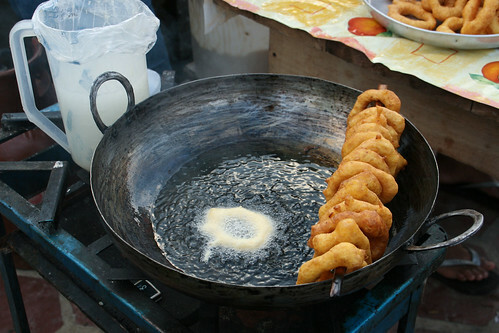 They are deep-fried to order right on the street or at a restaurant, so they are always warm and drizzled with corn syrup of all things. Sort of makes you realize this dessert is taking years off your life. Personally, we would have loved a little more variety in our toppings but when in Perú, do as the Peruvians do. Then Manjar Blanco tricks you into thinking it’s caramel but it’s not. 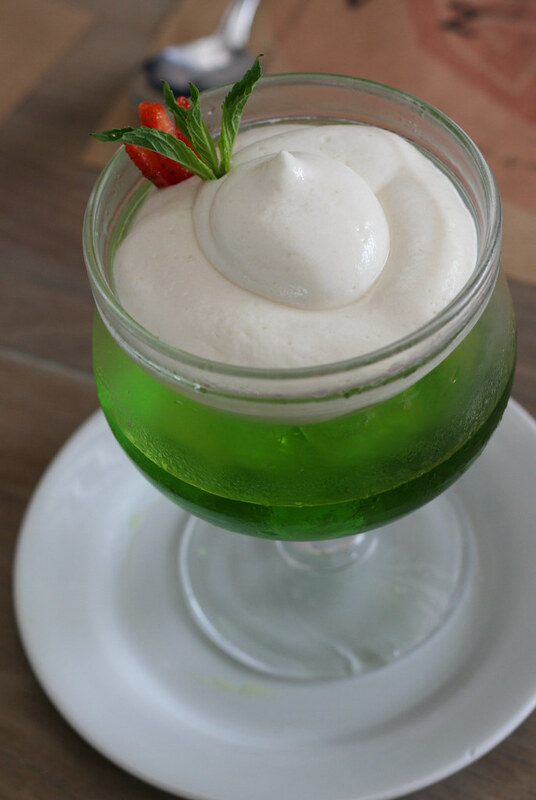 Manjar Blanco is made from milk instead of sugar, giving it a creamier, less sweet taste and texture. It is in everything like a frosting, thicker than Americans dare use caramel. The most common sweet featuring Manjar Blanco is Alfajores, two round cookies dusted with powdered sugar, with the thick cream in between. 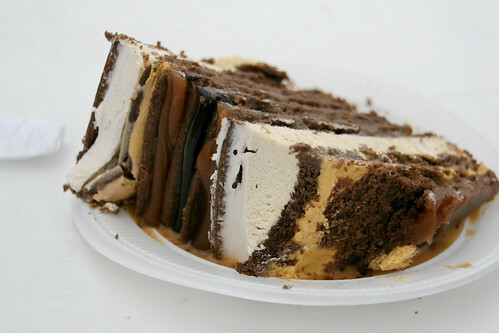 Manjar Blanco made it’s major coup in a gigantic layered cake of thin, dense sponge filled with fudge, mousse and other rich sweets, often ten layers deep. The cookie version can be good but is sometimes dry. The cake version is a monument to overcoming richness, not very easy to finish but very tasty. 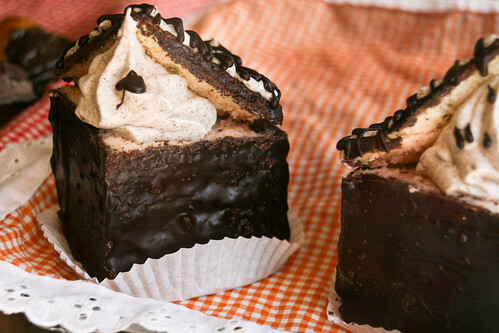 It is a dense meringue, somewhat akin to a marshmallow cream, on top of a dulce de leche pudding. Simple and rich or complex as you want it to be. 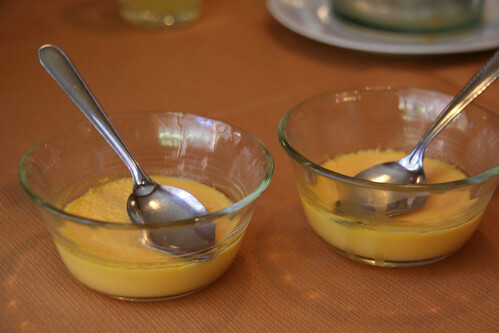 The pudding can be found in as many tantalizing variations as there are Peruvian women: Maracuja, Lime, Strawberry, Chocolate. 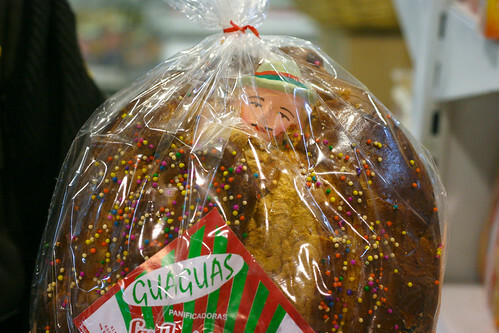 Maga Mis Suspiros in Lima specializes in this dessert and it’s varieties. 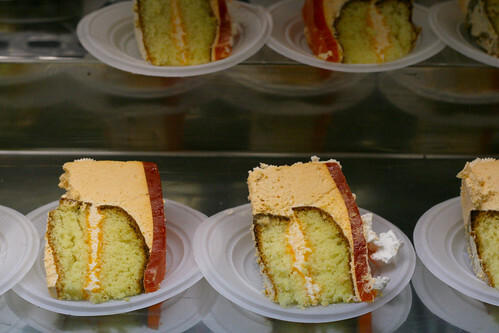 We drooled over their display case and, with the small threat of a diabetic coma in our future, left with the Maracuja Suspiro and another of those fabulous Tres Leches cakes. We are in Peru now and have tasted tons of savory dishes, but have yet to embark on exploring sweets. This is an awesome guide to get us started! Thank you! !